Shoppers who look for a great hatchback are generally looking for a car that offers both great fuel efficiency and a very versatile cargo configuration. Many of the hatchbacks built today are great choices for the back to school crowd in both high school and college as well as making great choices for city drivers who don’t have a long commute to and from work. As awesome first cars for young professionals who are trying to make their mark on the world, or even daily commuters for those who have a longer commute than most, the hatchbacks offered on the market in today’s automotive world make great choices for just about anyone to enjoy. With fuel efficiency in mind, here is a list of ten great hatchbacks for the new 2015 model year. To start off is the Versa from Nissan which has become a very popular and highly affordable vehicle making it a great choice to fill a lot of needs. With a split folding rear seat and hatchback space, the Versa offers a lot of cargo configurations to allow some strangely shaped items to be hauled. The Nissan Versa shows up on this list powered by a 1.6-liter four-cylinder engine that brings in 109 horsepower. Most of the cars on this list will have low horsepower as they are some of the lightest cars on the market. The Versa brings in fuel efficiency of 31 city/40 hwy mpg making it easy to enjoy on the road and avoid the pump for a long time. One of the most popular hatchbacks on the road today is the Golf. As a very capable and attractive hatchback the Golf gains a ton of popularity with its more powerful engine that is diesel powered and easy to enjoy handling that can really handle any and all road conditions. The Golf shows up on this list powered by a 2.0-liter turbo diesel four-cylinder engine that makes 150 horsepower. The Golf comes in with awesome fuel efficiency, especially on the highway, at 30 city/45 hwy mpg. The smart fortwo is a hatchback with very limited space. Truly this is a car that should be used as a commuter car mostly in the city as it is one of the tiniest vehicles on the road. Even with its minute size, the fortwo does offer plenty of room for the driver to be comfortable in the car and drive with ease. The fortwo comes in powered by a 1.0-liter three-cylinder engine offering only 70 horsepower. Not the most aggressive or energetic on the highway, the fortwo does offer fuel efficiency that shows up at 34 city/38 hwy for owners to enjoy. The Honda Fit is an extremely popular and versatile hatchback offering plenty of great styling as well as room for some interesting cargo configurations. The Fit shows off with a smooth transition from hood to roof along with a beltline that moves it way from the wheel well up across the doors. 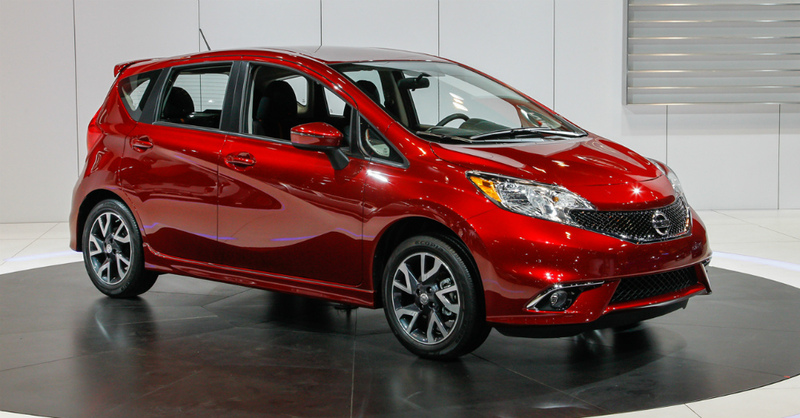 The Fit is powered by a 1.5-liter i-VTEC four-cylinder engine that has 130 horsepower. The Fit offers fuel efficiency that comes in at 33 city/41 hwy mpg making this a great hatchback for anyone based on fuel efficiency, drivability and looks. The Mirage is one of the smallest and least expensive vehicles on the entire car market for 2015. With an interesting and appealing shape the Mirage looks a lot like it has been rounded at every edge to make it have a flair for the new and interesting rather than just the same old style that is found on most other hatchback vehicles. The Mirage is powered by a very small 1.2-liter three-cylinder engine that offers a measly 74 horsepower which is plenty to get this little car going. Not meant for the highway, but offering very nice highway fuel efficiency, the Mirage offers a fuel efficiency that shows up at 37 city/44 hwy mpg for owners to enjoy and take full advantage of. The plug-in version of the Toyota Prius offers a lot for owners to enjoy. The Prius comes in a shape and size that is actually larger than most hatchbacks on this list but comes in with some of the greatest fuel efficiency to enjoy for any owner. The plug-in model is powered by an electric motor that must be recharged and the statistics have not been released as of yet. Whether driven mostly in town or out on the open highway, the Prius is a great vehicle for anyone to enjoy the awesome fuel efficiency that is found in this vehicle. The Prius, in a non-plug in model is a hybrid car that has become the benchmark for all hybrid technology in the automotive industry. The Prius is sharp and stylish and fun to drive with Toyota performance and handling. The Prius is powered by a 1.8-liter hybrid four-cylinder engine that offers 134 horsepower. The Prius comes in the list with some of the best fuel efficiency, especially in the city, showing up at 51 city/48 hwy mpg for owners to take advantage of. The Volt from Chevrolet is an electric hybrid hatchback that is very stylish and enticing. This car can be had in both a hatchback and sedan model offering the advantage of greater cargo configuration for the hatchback as well as the awesome efficiency of the electric motor. The Volt is powered by a 149 horsepower electric drive Voltec motor backed up by a gasoline range extending motor. The gasoline rang extender simply adds a ton of range to the Volt which can only run 38 miles on the electric motor by itself, but with the recharging and range extending engine in place the Volt range increases to nearly 380 miles. This allows the Volt to enjoy a 93 MPGe for the electric motor along and 35 city/40 hwy mpg for the range extender. Moving into the all-electric models of the hatchbacks, the Nissan LEAF never has to enter a gas pump at all. The LEAF is a very small and cartoonish car with a front end that has a ton of actual personality looking like it should start talking on its own. The LEAF has room for four to occupy the cabin and a bit of a cargo configuration although both ways the LEAF is a tight fit. The LEAF comes in powered by a 107 horsepower AC Electric Motor that offers an equivalent 126 city/101 hwy mpg. The LEAF does take about eight hours to recharge on a 220-volt dedicated line and offers a range of approximately 84 miles making this a great car for in town commuting and errand running. The Chevrolet Spark EV is the electric version of the Spark that is powered by a 140 horsepower electric motor. The Spark is tiny and fun, making it a really great vehicle for the back to school crowd or running errands around town. Its diminutive size makes it easy for the Spark to fit in just about anywhere in town to park. The fuel efficiency equivalent comes in at 128 city/109 hwy mpg making it the most fuel efficient hatchback on this list of great hatchback vehicles. The Spark EV will take around seven hours to charge on a dedicated 240-volt line and offers owners a range of about 82 miles on a full charge. With ten great hatchbacks to choose from, with the two most important components of owning a hatchback being considered, fuel efficiency and flexibility of cargo configurations, the cars on this list make easy choices for anyone looking for a new hatchback. The difficult choice will end up being what equipment and features are desired to go along with the fuel mileage that is so easy to enjoy.